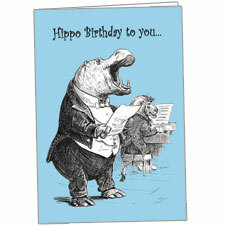 A singing hippo from a 19th century illustration graces the front cover of our Hippo Birthday greeting card. Sir Hippo sings a tune while Mr. Lion accompanies him on piano. This card is a Hippo Mojo Exclusive, which means you won't find it elsewhere! Size: Folded to 3.5" x 5"